Project Management Institute incorporated The PMI Talent Triangle™ on December 1, 2015. The purpose of doing this was to ensure that individuals were getting more than just knowledge about technical skills. They wanted to see individuals gain vital skills in leadership and business management in order to enhance business development and success. Having a strong foundation in technical, leadership, and strategic and business management gives individuals resources that are valuable in today’s workplace. 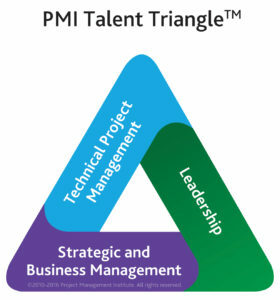 While The PMI Talent Triangle™ may be a little confusing at first, don’t worry! We’re here to help you understand it! All of The Mathis Group’s project management training courses are aligned with The PMI Talent Triangle™. At the top of our project management course descriptions, we break down each aspect of the Talent Triangle and show you how it applies to every PMI® certification.